Ooooh fabric. How I love it. I shop mostly online because of the life phase I'm in. I had a poor experience taking my kids to a quilt shop a few years ago, but am starting to see that maybe that is the exception, not the rule. The quilt shop I went to today was amazing! Nevertheless, the kids don't really allow me the kind of time in the shop I need to really think over such important purchases :) So, here are a few places I like to shop online, though I am completely in favor of supporting one's local fabric shops! I generally buy 1/4 yards of things I like, and 1 yard of things I love or think I will use for binding. Here are my favorite places to do so. 1. Etsy- I value selection, price, and yardage options for each print, that way I can easily create my own fat quarter bundle. Starlit Quilts- My favorite! I love her selection, her colors and designers are just my cup of tea. She is also my go-to longarmer, with edge to edge and custom. Fresh Modern Fabric- I love their modern selection, and the orders come packaged to perfection. Seriously, I don't know how she folds and stacks fabric SO perfectly. Also, I have to admit that I have a little crush on the owner's name- Alice Essinger. I mean how classy is that? Stitches n' Giggles- You can't beat the prices in this shop, and they have a wide selection of all my favorites. Good Aurifil prices too. Simply Love Fabrics- I have vexed these poor ladies (mother/daughter duo) with complicated custom orders a time or two :) They have been very patient and helpful, and have even been known to sneak in cute little buttons and mints! Happy mail at its finest. 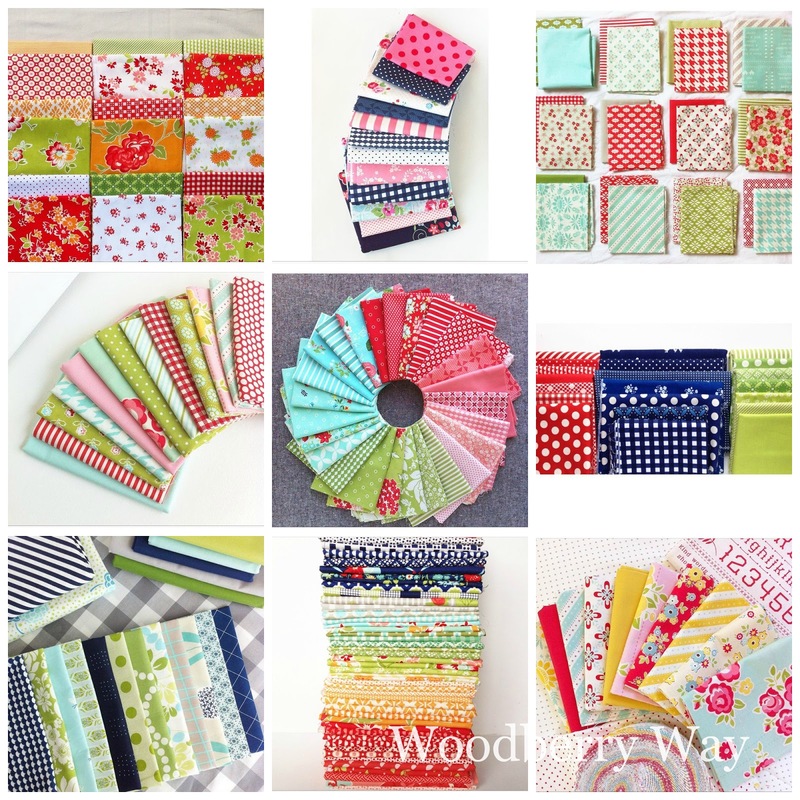 Uberstitch- woooonderful selection, I've found some real beauties here that were outside my normal designer choices. Sterling Quilt Co.- Sterling is a dear friend who has recently expanded her longarm services to include amazing custom quilting as well! Pick a backing from her shop and you're set to go. Handmade is Heartmade- always has great taste in things to carry, and has an ever growing selection! Catching Stitches- often has $35 five yard backing sales. The best! KiwiFabric- a local-to-me shop with fun colors, great low volumes, and a wide modern selection. She also carries my Folk Stitches kits! SewStitchingHappy- a newer shop with impeccable taste for custom bundles. Seriously, such pretties there, you will be delighted with what you see! Janum Fabrics- I've shopped here many times, and sadly, they are closing! Go take advantage of the great sales going on. 2. #thegreatfabricdestash on Instagram. This is a great way to get some bargains, as well as older lines. I've only been sewing for 3 years, but I've gotten some beautiful older lines on the destash. It's addicting, watch out! If you haven't used it before, usually you just leave you PayPal address on the listing to claim it, and they will send you an invoice to pay. 3. Fabric Bubb- gorgeous modern selection, and they carry every Kona color, I love that. Her custom bundles can be really fun too! 4. Cottoneer- this is an absolutely beautiful, new-ish shop. Curated bundles, modern basics, and some fun different substrates like linens and wovens, etc. 5. Fabric.com- They have some Kona solids, great prices if you buy a lot (good for backings), Aurifil thread, Cotton and Steel, and free shipping over $35, gotta love that. It does take a while to ship so plan ahead. There's so much on this site, it can get overwhelming, so you kind of have to know what you're looking for and put it in the search bar, otherwise you'll be scrolling for days. Those places consist of 99% of my fabric shopping. I hope that is helpful to someone. I shop on Etsy a lot especially for yardage and I order my Art Gallery fabrics from Llama Fabrics, on Etsy, as she has better shipping prices!! I always look at Green Fairy Quilts for any Moda pre cuts because they have free shipping. I do ck eBay too because I sell my older lines there but for just a few items only. I will look to Fabric dot com for some solids. Great information! I will have to check those out, thank you Judy! I'm in the UK, I shop for fabric mostly at my local shops. If you don't support your local shops you loose them, and I prefer to see the fabric colours before I buy. Also I am usually in too much of a hurry to wait. That said I so buy some fabric as well as wadding and stuff online at Cottonpatch.co.uk as they sell the wadding I like at a good price. Wish I could get free shipping though, I would have to spend over £100 for that. I only have one local shop and they specialize mostly in batiks and novelties so I'm finding myself shopping online more and more. Fabric.com is a great source that I've used quite a lot this past month. Some of the others are new to me and I can't wait to check them out. Thanks for the tip! You are welcome Patti. Sounds like your shops and mine are about the same- batiks, novelties, and low quality solids. I'd love it if they carried modern lines and brighter colors. Thanks for sharing Shannon! I'll have to check out Mad About Patchwork. Great stores, you listed some of my favorites!